An Outstanding Pair of Flintlock Blunderbuss Pistols by Nicholson of London. An Outstanding Pair of Flintlock Blunderbuss Pistols by Nicholson of London. With belled three-stage, octagonal to round barrels, stamped with Irish registration marks ‘CL318’ and ‘CL319’ (for County Clare) and London proofs, and fitted with sprung bayonets beneath, ramrods to the left, signed border engraved box-lock actions, signed ‘LONDON’ within an oval surrounded by stands of arms to the right and ‘NICHOLSON’ within an oval to the left, sliding thumb piece safety catches that also lock the pans, beautifully figured walnut butts, steel trigger guards that also lock the bayonets. Shop in Cornhill, London. Made flintlock, box lock pocket pistols and officers flintlock holster pistols. 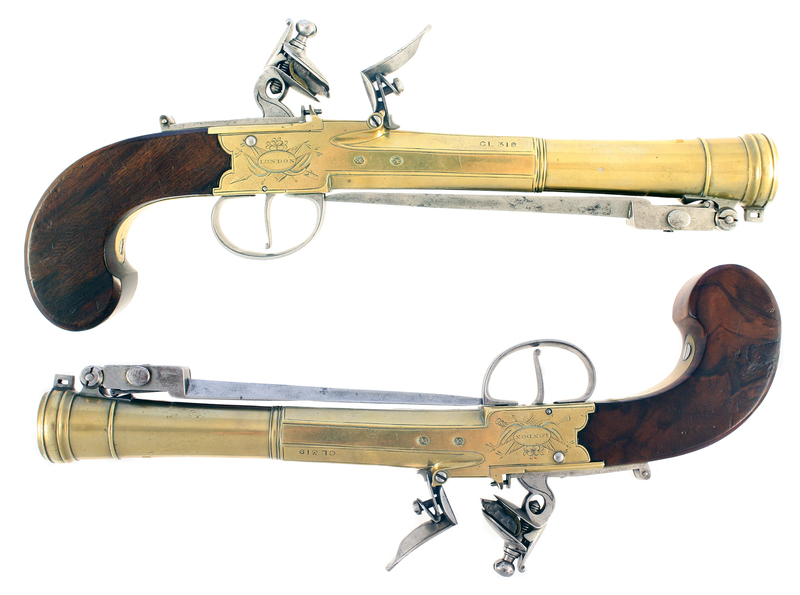 Cased pairs of flintlock duelling pistols with loading accessories. Also made flintlock carbines and muskets with Royal Cypher. William Free of Gunmakers Co. by redemption, 1780. Took Livery, 1788. Elected Assistant, 1790; Master 1793. Gunmaker, 17 Houndsditch, 1779-86; 45 Cornhill, 1786-94. Contractor to East India Co., 1779-94. Trade label advertised new-inventred HOUSE GUNS, that, when fired in the Centre of the Room, will turn to the door and or windows, and fire, if attempted to be forced open in the night or any other time by Robbers.